Luxury sailing yachts have transformed greatly in recent years, undergoing a metamorphosis from what used to be considered as a simple sailing vessel, to one which can afford you a vacation in the absolute height of luxury. Here at Nicholson Charters we will provide you with everything you could possibly think of, (and some things you had not even thought were possible!) in order to fully ensure your safety and comfort while on board. Many people choose to spend part of their holiday on a luxury sailing yacht as it means there is the opportunity to fully explore some of the most delightful destinations on earth, such as the BVI and the Caribbean. 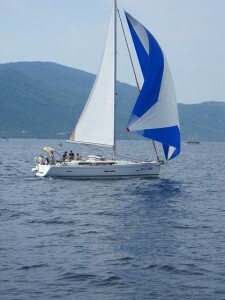 They may also decide to spend their dream holiday vacation in one of our luxury motor yachts. When you decide to charter a luxury sailing yacht, you must do a great deal of research first to ensure that you and your family will get everything you want out of what will be a vacation of a lifetime. After all, you work hard all year long to finance your vacation and therefore you want to make sure that you get the most for your money in these difficult times. Nicholson Yacht Charters and Services give you the option to choose between several luxury sailing yachts, ensuring that you will indeed find the vessel of your dreams for your vacation. We always ensure that all of our sailing yachts are maintained to exceptional safety standards, so you can be safe in the knowledge that nothing will go awry with your vacation plans. Depending on the size of the luxury sailing yacht you choose, the number of crew you get to oversee your vacation will vary, but you can rest assured that it will always be the optimal number to suit the size of the vessel and also the size of your party. Our superb crew will always go beyond the normal call of duty if you have a special request to make your vacation even more memorable. Whether you would like to announce the forthcoming birth of a child, or propose to your loved one in one of the most romantic settings in the world, doing it on board a luxury sailing yacht will mean that none of you will ever forget the experience. The areas we visit are breath-taking and include the British Virgin Islands and the Caribbean, so there will be something to suit every taste, all overseen by some of the most professional crews in the world. If you want a special meal cooked for you by a chef who would not be out of place in a top-class restaurant, then feel free to go ahead and request. We will do our utmost to ensure that you have everything you could possibly desire when you charter a luxury sailing yacht, and all at an extremely competitive price.